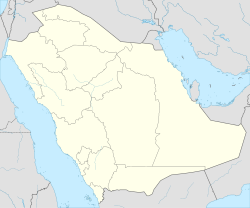 al-Quwayʿiyah (also El Kuveyiye, Arabic: القويعية‎) is a city in Riyadh Province, Saudi Arabia.It is located in the west of Riyadh, 165 km away. It is considered as a major stopping point on Riyadh-Makkah Highway. AlQuway'iyah's population is approximately 126,161 people, therefore, it is considered to be one of the largest governorates of the Kingdom including a large number of villages of the province and it includes several government departments, colleges and health institutes. This page was last edited on 21 November 2017, at 13:49 (UTC).